Note: If you want, you can skip to the summary. 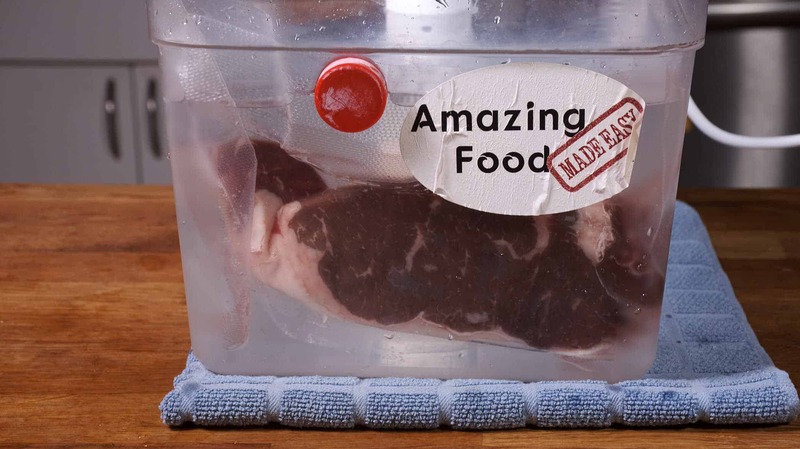 Recently I have done a number of reviews highlighting different solutions to the sous vide "floating bag challenge". Specifically, this is when the sous vide bag in the water bath begins to float, exposing a portion of the contents above the water level. There are several things that can cause this floating, with the most common being an excess of air in the bag. Another cause is by buoyant food such as several types of vegetables or frozen proteins such as chicken. 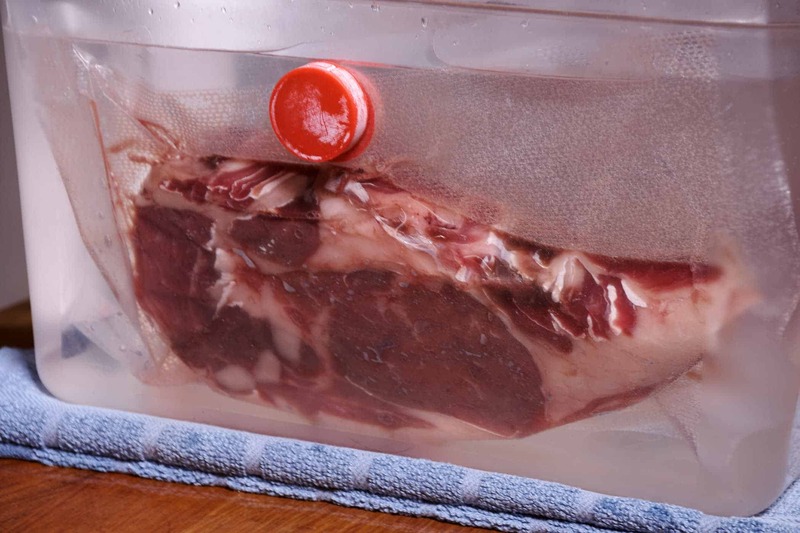 There are a number of ways to Prevent Sous Vide Bags From Floating. I have done detailed reviews on SO-VIDA Sous Vide Weights and Disc Neodymium magnets. This article will cover SV Homewares Sous Vide Magnets which are quite different in a number of ways. The SV Homewares Sous Vide Magnets covered in this review are ferrite magnets, also known as ceramic magnets. Because of their low production costs and the resistance to heat and corrosion, ferrite magnets are among the most popular for everyday applications. I will provide some additional information on ferrite magnets in this section. Note: In an earlier review I covered using disc neodymium magnets for sous vide. There are currently 27 grades of permanent ferrite magnets commercially available all of which have different ferromagnetic properties. The chemical compound of ferrite magnets is SrO-6 (Fe2O3), a combination of strontium carbonate (10%) and iron oxide (90%). Both materials are abundantly and economically available. The most popular grade of permanent ferrite magnets is Y30, which is the grade used for these sous vide magnets. Like all magnets, temperature affects their behavior, but unlike rare earth magnets (neodymium magnets), when ferrite magnets get hotter, their resistance to demagnetization increases. This is one of the advantages that the SV Homewares Sous Vide Magnets have over the disc neodymium magnets. As mentioned in the neodymium review, temperatures above 176°F (80°C) will permanently reduce the strength of the neodymium magnet. So if you sous vide a lot of vegetables you will definitely be better off with the SV Homewares Sous Vide Magnets. Since there is iron in the magnet, if exposed to the elements, the magnet will rust. Therefore, you will typically see the magnet covered with a variety of different types of coatings. The SV Homewares Sous Vide Magnets are covered with a food grade silicone. This prevents the magnet inside from rusting, but equally importantly, provides an excellent material to simplify the handling of the magnets as well as facilitating the "grip" of the magnet to the sous vide bag and/or side of the water bath. You may notice when using these red magnets that the one that's in the water bath may become coated with a light white powdery residue. Apparently this is made up of mineral deposits (e.g. calcium) in the water. This is more of a problem when the water is fairly hard, but the film can just be wiped off with a damp cloth. Perhaps the largest drawback to ferrite magnets is that they are much less powerful than others. 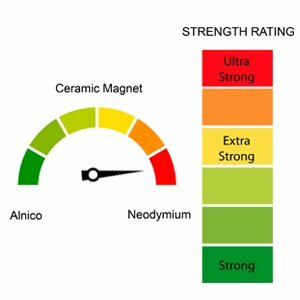 For example, neodymium magnets are between 7 and 14 times stronger than the strongest ceramic magnets. But for the sous vide application, the magnets don't have to be super powerful in order to achieve their function of pinning the sous vide bag to the side of the water bath container. In fact, as I highlighted in my last article, with the more powerful neodymium magnets you need to be safety conscious since you can actually do physical harm to yourself with the more powerful ones. In my experience, the strength of the SV Homewares Sous Vide Magnets is definitely less than the neodymium magnets I tested, but plenty strong enough to work well. I was using the "Jumbo" size of the magnets for my testing. They are larger in diameter than the "Regular" size, 1.2" vs 0.7" (30mm vs 18mm) respectively. With the small difference in price (~$2.00) between the two sizes, I would strongly recommend purchasing the Jumbo size. As you can tell, I'm a proponent of using magnets when cooking sous vide. I used the disc neodymium magnets for quite a while before having the opportunity to try the SV Homewares Sous Vide Magnets. Over time I have decided I prefer the red magnets best of the two. Both work equally well at pinning the sous vide bag to the polycarbonate water bath container, but the SV Homewares Sous Vide Magnets are simply easier to use and store. There are three factors leading to this outstanding usability. 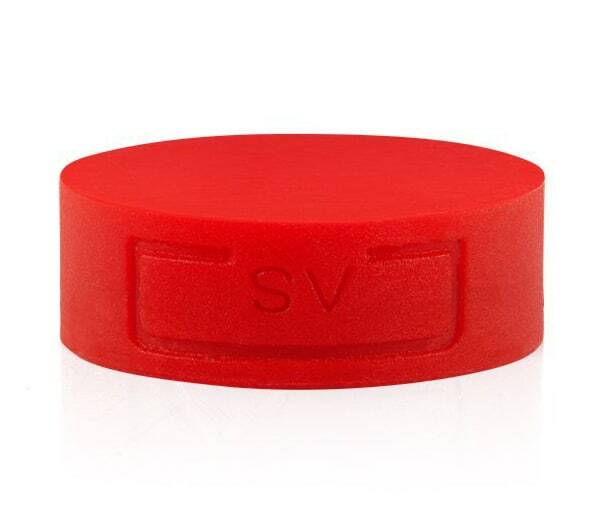 The red silicone coating has a major impact on the usability of the SV Homewares Sous Vide Magnets. First, since it's easy to grab just one magnet, it makes it quite easy to remove a magnet from the stack without the use of spacers or other techniques required with disc neodymium magnets. Second, the "rubbery" texture of the silicone provides some friction, which allows it to "stick" to both the sous vide bag and the side of the water bath. With most things, "More is better! ", but with my experience with sous vide magnets, that's not necessarily the case. 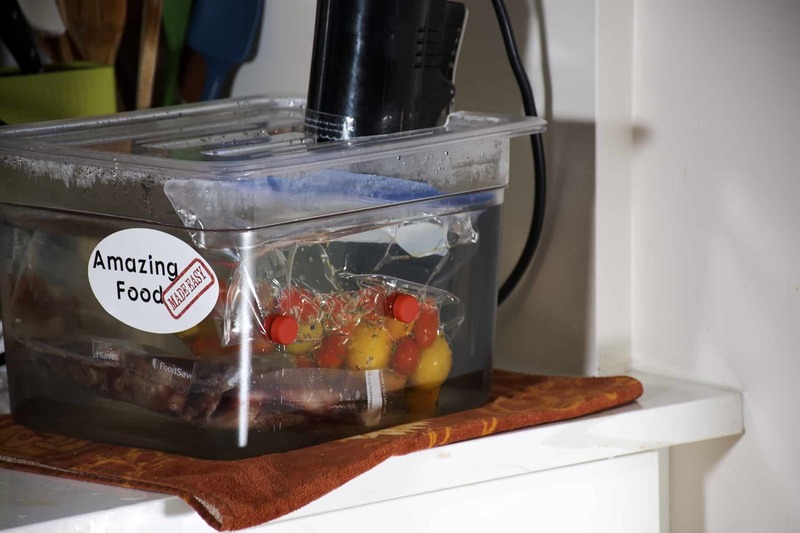 In my opinion, the design of the Jumbo SV Homewares Sous Vide Magnets has achieved a good strength balance: strong enough to keep the sous vide bag pinned to the water bath, but not so strong that they are unsafe or require special handling techniques for using and storing them. The size of the Jumbo red magnet is approximately 1.2" x 0.375" (30mm x 10mm). The combination of the silicone coating, coupled with the thickness of the magnet, makes it quite easy to grasp a magnet and manipulate it as necessary. While at the same time, it is small enough that a stack of 8 magnets takes a small amount of space in your kitchen drawer. Jamie at SV Homewares shared an interesting tidbit with me regarding magnet sizes. He indicated, that to be sure that magnets are not a hazard to young children, Amazon has a policy on strong magnets where they have to be too big to fit in a cylinder that is 2.25" long and 1.25" in diameter. In my opinion one of the greatest advantages of magnets in general is that they are used external to the sous vide bag, rather than internal. Some solutions require putting some sort of "heavy" item in the bag in order to weigh it down. Regardless of what an item is made of or covered with, I get a little nervous with it being in the bag contacting the food. Perhaps this is just me? Also, since it does not need to be placed in the sous vide bag, it can be added at the last minute as the bag goes into the water bath. For example, you would not have to freeze the item with the food in the bag. The SV Homewares Sous Vide Magnets take very little room in your sous vide water bath, unlike some ad hoc type solutions. It is quite easy to fit in at least two bags on each of three sides of the container. This will work well for most families. Similarly, the magnets themselves don't take up much storage space in your kitchen drawer since they stack and un-stack easily. 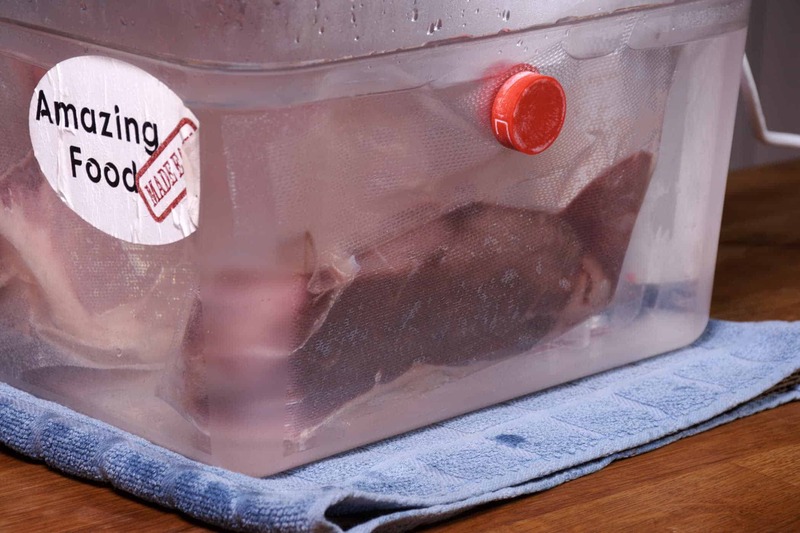 Occasionally you will hear the argument that since the bag is "pinned" to the side of the water bath container, that the contents do not get cooked evenly. Although a portion of the bag is "pinned" to the side of the container, in my experience, the remainder of the bag is usually floating free, allowing plenty of circulation. Having used these SV Homewares Sous Vide Magnets for a few months, they have become my "go to" solution for the floating bag challenge. I like them a little bit better than the disc neodymium magnets because of their better usability. They are relatively inexpensive, flexible and easy to use, and do not take up much room, either in the bath or when stored. 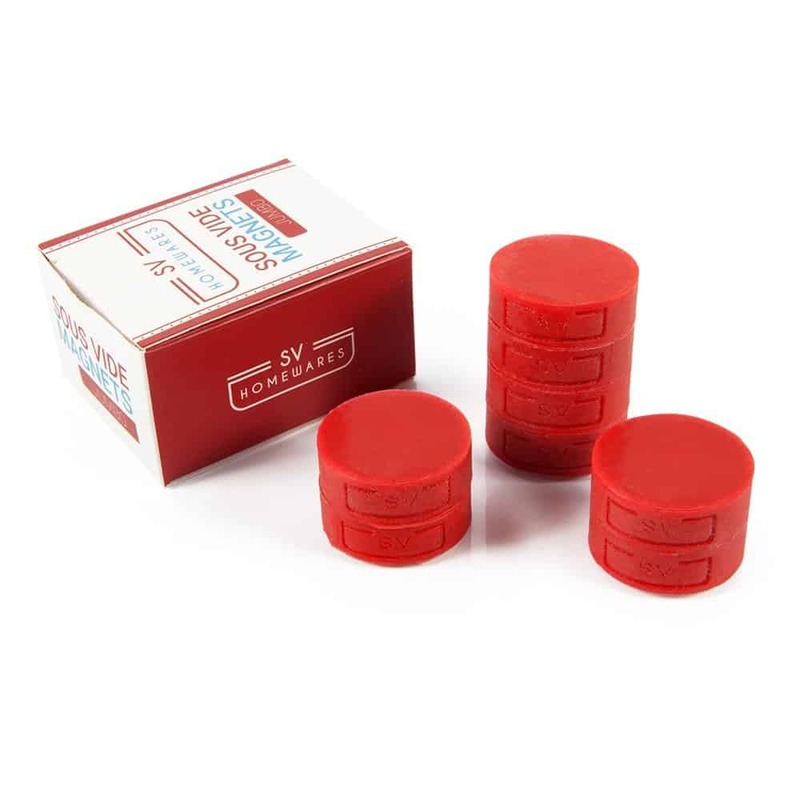 I would definitely recommend that you might want to include a set of these red magnets in your sous vide "toolbox" as one viable solution to prevent sous vide bags from floating. If these SV Homewares Sous Vide Magnets sound like something you would like, you can get them on Amazon. If you have experience with SV Homewares Sous Vide Magnets used for sous vide, I would appreciate you sharing it in the comments below or our Facebook group. Thanks.